Home » What are the Most Common Causes of Injuries for Commercial Fishermen? What are the Most Common Causes of Injuries for Commercial Fishermen? Bad weather conditions. Foul weather can create a dangerous situation. Winter in particular creates rough conditions with high waves that can freeze into ice on the deck. Fishermen, particularly crabbers, must be extra cautious when the weather is unstable and make sure to remove the threat of ice from the deck. Lack of safety gear. Fishing companies and vessel owners must make sure to provide safety equipment, such as survival suits to protect against hypothermia, life rafts, radio beacons and life jackets. Lack of training. Younger workers are often drawn to the idea of the commercial fishing industry for the wages and adventure. It is not uncommon for fishing companies to prey upon that and not provide new crewmembers with the training they need to safely set out to sea. Vessel owners must make sure the crew is properly trained to avoid dangerous situations and what to do in the event of an emergency. Exhaustion. Studies show that exhausted drivers behave more like drunk drivers on land and this is definitely applicable to workers at sea. Exhaustion leads to mistakes, which can lead to injuries. The culture that surrounds the fishing industry is that being tired is just part of the job. However, longer sleep rotations must be employed and enforced in order to reduce this risk. It is important that fishermen understand that injuries are not inevitable and they have options, should the worst occur. If you have been injured at sea, it is important to consult with a maritime attorney who assess your case and can help determine what steps you should take moving forward. 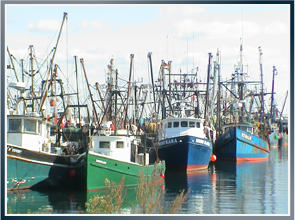 Latti & Anderson LLP is a maritime law firm with offices in Boston and New Bedford, MA that helps workers injured in commercial fishing accidents. Previous What Happens When a Maritime Worker is Injured On Land?